Optimization may be the best application topic taught in standard math courses. Why do we use math in the real world? Because we want to make something better. I don't care for the problems that are about maximizing profit, as if other considerations aren't relevant. But when we make something, we are trying to satisfy a need, and we have particular goals - maximizing how well we achieve those goals can sometimes be modeled mathematically. 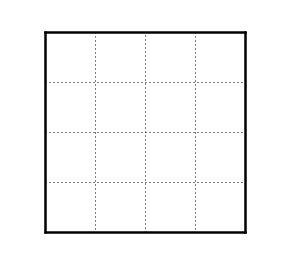 Making a box that maximizes volume with a given amount of material is a simple problem that makes sense to all of us, and that represents well the class of problems we can solve with optimization. So that's how I begin our study of optimization (probably thanks to another blogger, though I don't remember now who it might be). Yesterday I brought in origami paper and showed the class how I would fold a simple box. Their task was to make the box with the biggest volume. I've done this lesson before, but I added a few details this time that improved it dramatically. I want to write up what happened so I'll remember it next semester. This is a class with over forty students. I set them in groups of four, had one person come up to get four sheets of the origami paper, and then showed them my steps. I fold in half twice in each direction, reverse two folds so the sides can come up, and make a triangle at each corner that can then fold out over the edge to lock the corner in place. Fold wherever you want for your height. Fold in half so you can copy this fold to the opposite edge. 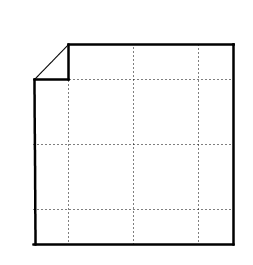 Fold one corner onto this fold, creating a 45-45-90 isosceles triangle. This give the position for the other sides, so that they'll be the same size. Now fold your four sides up, and make the triangular corner bits as before, folding over the edge to lock. When the box is made, measure to determine length and width (which are equal), and also the height. As they worked, I ran off to get the rulers I'd forgotten. I think that had unintended benefits. Before I left, I asked who had done origami before. I asked the others to look at the hands up, and turn to them for help. Then I ran off, and left them to it. I think the learned helplessness that schooling engenders in so many students was minimized by my absence. After I passed out the rulers to each group that didn't have their own (love those students who carry rulers around with them), I asked whether we wanted to measure using inches or centimeters. I heard lots of them say centimeters and went with that. Good thing, because that worked better with decimals, and gave us an even measurement on the paper, which was exactly 15cm by 15cm. Then I asked who had their box measured, and began to make a table on the board. After I wrote the height Edwin had given me, I asked how I would find volume. The student I asked didn't know (which surprised me). I asked them to visualize little cubic centimeters filling the box. I could see that wasn't enough, so I had them all visualize a big box on my desk, 3 feet by 4 feet by 2 feet high. Then I used my hands to describe a cubic box, 1 foot in each direction. How many of these fit along the back of the big box? Yes, four. And how many rows of four? Three. So how many are in this bottom layer? Twelve. And how many layers? Two. So the total is ... twenty four. And now we can see that the volume of any rectangular box must be... I think they had all memorized V = LWH before, but few of them had seen why it must be so. This visualizing helps them see where the formula comes from, and is a start for many on the journey toward being able to visualize things like volumes of rotation. I put the height Edwin had given me onto my diagram of a paper with the fold lines, and talked my way through finding the proper length and width. I asked Edwin to find the volume. I repeated with seven more volunteers. For each one, I'd figure the height as I did the first time, saying I didn't want to go by their measurements, in case they measured high and got an unfair advantage. That allowed me to prime them to notice that we were always subtracting twice their height from the width of the paper. 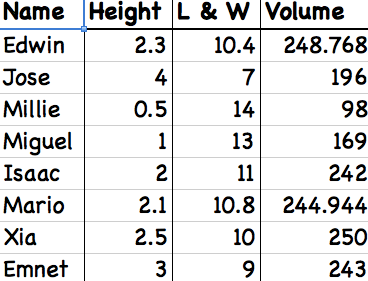 As I added entries to the table, I also added them to a graph of height versus volume. I noticed that it looked like it could be a parabola, though we didn't yet know its shape. I talked about the extreme points - how a height of 0 or 7.5cm would give a volume of 0 - and added those to the graph. I knew the lesson was going well when one of the students wondered how we could figure out the best volume. We had not yet written a function, but we were getting close - as a group! I got to talk about modeling and mathematizing. I also mentioned that experimenting with particular cases was one of my favorite ways to get more grounded in what might be going on in a particular problem. 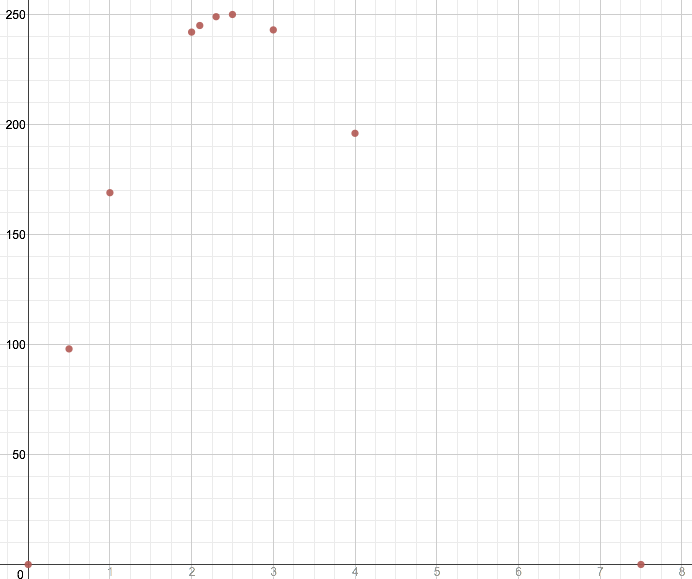 I got to point to my graph, with a curve running through the points (Can I do that on Desmos? ), and asked what calculus would say about this problem. They were able to tell me that the highest point was where the derivative was 0. I drew the tangent onto the graph and wrote y'=0. I had them work in groups on simplifying the equation we had written, and finding the x values that would make the derivative equal zero. I pointed out that it was a cubic, with a double root, which they should know how to graph. I sketched in the full graph past x=0 on the left and past x=7.5 on the right, and got to mention the domain of the math function (all reals) versus the domain based on this problem, which is 0 < x < 7.5. The quadratic we got from the derivative isn't easy to factor, so we used the quadratic formula (giving me a chance to be silly and sing it). We saw that one of the solutions, x=7.5, would give a volume of 0, which is a minimum. I talked about how we would know that the other point at x=2.5 is a max, even without a graph, since the second derivative, V" = 24x-120, is negative there. As I summarized what we had discovered together, I said that this problem was unusual in that it didn't seem to have two equations, where most optimizing problems will. That had been my impression in the past. But as I described where we began, wanting to maximize V = L*L*H, I saw that it was like most optimizing problems - a function with two variables. And our constraint, which I now labeled, was L = 15-2H. I moved on to a quick walk through the problem of fencing a pen attached to a barn. I said I was imagining I had a barn and a big enough yard to have a goat. I want the pen as big as possible given 200 feet of fencing. Students were able to give me all of the steps for this problem. I think the best thing I did in this lesson was to draw the graph of height versus volume, so they could see that the derivative of the volume function gives us the maximum. Teaching a big group energizes me. I feel like this is the best I've done yet teaching Calc I. Whether they are really getting it is unclear to me - the downside of such a big group. On Monday I'll have them work in groups on two or three problems. Any suggestions for your favorites? I've just finished optimization, but I'll keep this one for next year. Thank you! This is so cool! You do not need to be teaching calculus to use this activity!